Hu Yaozhen, born in Yuci County, Shanxi Province, started martial arts practice at a young age. He also studied Chinese medicine and Daoism. He was a famous grandmaster of both Qigong and Xin Yi Liu He, and was given the nickname "Single Finger Shakes the World." The Japanese martial arts community calls him the "Chinese Martial Spirit." Hu had studied Daoism, neigong, Liu He Xin Yi Quan, and Hua Tue Wu Qin Shu with Daoist master Peng Ting Jun. 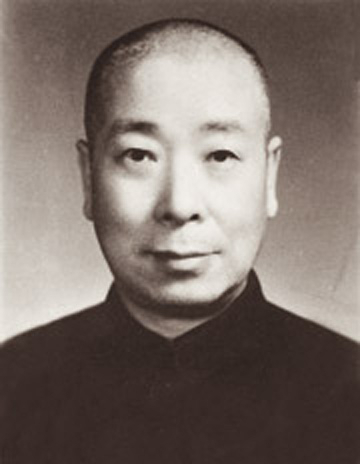 He also studied Xin Yi Quan, and Shou Dong Chen Ji Quan Pu from Dai Wen Jun in Qi County in Shanxi Province. He then studied Buddhist Gong Fa and Zhuang Zhi Tu Na Fa from the Buddhist monk Li Hong at Chong Shan Temple in Taiyuan, Shanxi Province. Hu continually practiced and taught martial arts and Chinese medicine for several decades. He had combined the essence from Buddhism, Daoism, Ru, martial arts, and Chinese medicine and reached a very high level, especially in his Qigong practice. He was the author of "Qigong Practice Method for Health" and other books. He shared his unique Qigong method in professional practice by opening the first Qigong clinic to benefit the general public. His Qigong clinic practice proved very effective in the Beijing area, and his method was recognized at the Bei Dai He Qigong conference and was widely promoted by the government in 1959. In 1953, Grandmaster Hu and his good friend Grandmaster Chen Fake, the 17th generation representative of the Chen Family Style Taiji, initiated the Capital Martial Arts Research Institute. The two contributed a great deal to the development of Chinese martial arts.